Onsite massage therapy is provided by Laura J. Ward who is a long time native of the Windsor Heights area. Laura received her Bachelor’s Degree from Drake University (LA ’79). 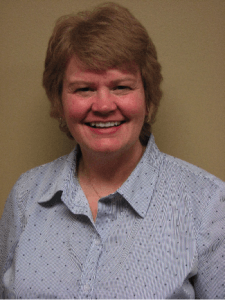 She worked in the Iowa House of Representatives until becoming a Massage Therapist in 1990. Her initial training was at the Iowa School of Natural Therapeutics, after which she took a series of trainings from Zhenya Kurashova in Russian Medical Massage. Laura has taken classes in a number of modalities since, but a recent favorite interest is Myokinesthetics, which uses specific muscle movement and stimulation along a nerve path to bring comfort from pain. Laura is a member of Associated Bodywork and Massage Professionals, and chaired the Examination Committee under the National Certification Board for Therapeutic Massage and Bodywork for a year. She is licensed by the State of Iowa. Dr. Davis has referred many of his chiropractic patients to Laura for co-management, including his wife Christina. Dr. Davis finds some patients require extra soft tissue therapy to quickly resolve their case and he highly recommends Laura! You probably have a good idea of what massage is, but may not know what it can do for you, specifically. I want to make it easy for you to find out. The best way to know my work is to feel my work. I am willing to gift any patient of Dr. Davis, or former patient of Dr. Norton with 30 minutes (normally $40) of free massage. One per person, as space is available. You may also upgrade to a one hour session for only $30, or a ninety minute session for $55 when you call me. I like to work within your comfort zone, and I have a lot of training and experience behind me to create a massage experience that fits your needs. There are no strings attached to this promotion. I’m just willing to work hard to create a full roster of people I can help the most. I hope that you will be one of them. Massage also makes a very thoughtful and appreciated gift for the holidays, special occasions, or after a stressful life event. I can create packages to suit any needs.